Love soccer, but need a break from the sun? 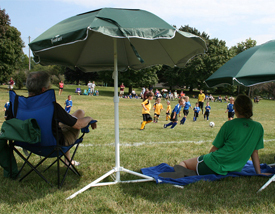 Let your JoeShade® portable sun shade umbrella keep you cool while you cheer on your child’s youth soccer team! The sturdy nylon umbrella blocks harmful UV rays and is supported by a powder-coated metal tripod with a broad base for increased stability. Lightweight and easy to assemble, the umbrella opens to approximately 60″ in diameter and Tilts to give you maximum shade protection. Its carrying bag has a convenient shoulder strap, making it easy to carry with you down the sidelines, to the bleachers, or wherever you watch the game. Order your JoeShade umbrella today and “Stay Cool” while enjoying the soccer game! Just Kickin’ Back in the Sun! Available in BLUE, GREEN or RED! Copyright © 2019 MITS Partners. All rights reserved. Website by Addicott Web. Copyright © 2019 MITS Partners. All rights reserved.